We are engaged in the business of manufacturing Cashew Nut Peeling Machine. This machine is precisely designed and takes utmost care of shape, nutritional value and freshness of cashew. 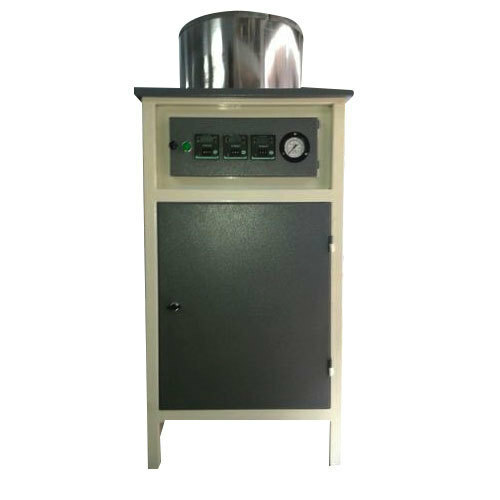 It is widely acknowledged among the customers for its high efficiency and robust construction. Incorporated in the year 2002 in Ahmedabad (Gujarat, India), we “Mahavir Industries” are a leading Manufacturer of a superior quality range of Steel Stamps, Oil Burner Machine, Cashew Processing Machine, Supari Cutting Machine, CNC Angle Line Spares, Engine Parts, Gripper Jaw, Angle Cutting Blade, Laminar Air Flow, Modular OT Frame, Surgical Scrub Sink and many more. The products provided by us are highly applauded among our customer owing to their qualitative features such as corrosion resistance, fine finish, high strength, easy installation, precise dimensions, etc. Our offered products are manufactured under the stern direction of our ingenious and dedicated professionals by making use of high quality raw materials and ultra-modern technology in adherence with industry quality standards. In addition to this, the provided products are verified on various measures by our team of experts to assure their durability and quality. In order to meet the exact needs and preferences of our renowned customer, we provide these products in numerous specifications at rock bottom prices within the promised time span. We also impart Precision Job Work Service and Heavy Steel Fabrication Service to our prestigious customers with no hassle.